Honey Boo Boo is Everywhere. Here Comes Honey Boo Boo premiered on TLC this past August. The show, a spin-off ofToddlers and Tiaras, inherited its parent program's polarizing qualities. Everyone has an opinion about Here Comes Honey Boo Boo. Here's a list of articles that isn't comprehensive, but captures the breadth of opinion and strength of conviction inspired by the show. 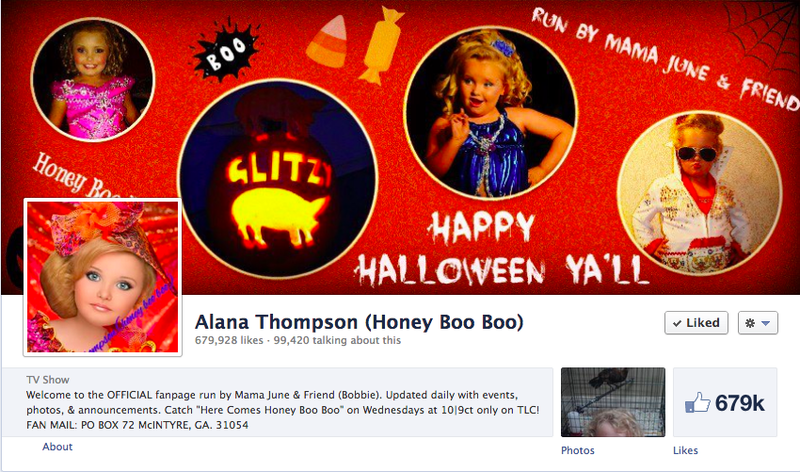 Another place that opinions about Honey Boo Boo circulate is Alana Thompson's--Honey Boo Boo, herself--Facebook fan page. Since Alana is seven, well beneath Facebook's 13-years-old age requirement, the page is run by Mama June and her friend, Bobbie. See? The page is a locus for fans and anti-fans to congregate. Fans use the page to write to all members of the show, especially Alana. A brief scan of the posts and comments on Alana's wall includes invitations to weddings (to be flower girl), expressions of gratitude for her and the show, pleas for donations or help promoting charitable causes, criticisms of Alana and her family, questions regarding the Halloween costume contest or Christmas toy drive the Thompsons are hosting, but mostly the posts are meant as direct interactions with Alana via the show. Here's an example. Every week Mama June and Bobbie post photo after photo of Alana, obviously all taken in succession, posing with each piece of fan mail she receives. They post the photo along with the senders' name, to say thank you. Please note the second to last comment. I love the internet. To take and post a photo for each piece of fan mail seems an excessive gesture of gratitude, but it is consistent with the folksy, "aw, shucks," attitude the Thompsons cultivate on the show. It is also appropriate considering Alana's age and inability to really interact with her fans via any other media outlet. The photos contribute to the authenticity that fans profess to love about the show. The photos are clearly amateur and unedited, not even to remove redeye. They are staged and taken in Alana's house--the show's set--and feature other characters (her sisters) and props (her pets/toys/furniture/outfits) that fans would recognize, verifying the authenticity of the lifestyle portrayed on the show. The photos are wildly entertaining. Because they're staged, taken, and posted en masse, Alana's waxing and waning interest in the enterprise is clearly evidenced. Undoubtedly, Mama June is keen to this and seizes the opportunity to allow Alana to do what made her famous--be over-the-top expressive. These photos also offer a level of interactivity to the fans. I'm unsure how long Mama June and Bobbie will be able to maintain this near-guarantee that your fan mail will be photographed with Alana and featured on her page. With 679,000 Facebook fans (at this writing) and it not being unusual for photos on the page to generate thousands of comments, the volume of interest, submissions, and consequential labor will become overwhelming. Alana's Facebook page is a site where labor, affect, and domesticity intersect as hallmarks of the subgenre Here Comes Honey Boo Boo operates within: intimate reality television. The series of fan photos provide, in some ways, an even more intimate glimpse than into the Thompson family (than offered by the show) by showcasing Alana and sisters in myriad emotional modes, featuring their home when messy and dirty, and signaling affinity through a shorthand language of Southern-inflected text-speak of the photo's captions. Honey Boo Boo is everywhere not only because the show has been magnified and multiplied across popular media channels (as demonstrated above), but because its intimate affects as represented by the relationships between the Thompsons are recognizable in familial structures of all kinds. Honey Boo Boo resonates as authentic, though what exactly that means is unclear. It is evident that the Thompson family is familiar, in all meanings of the word, but why their life as portrayed on the show is prized as authentic, or somehow more real, by fans and journalists is not so straightforward. I think Here Comes Honey Boo Boo's portrayal of class is at least part of the answer to why the show's authenticity is touted. Look for future posts on how class is marked and signaled in Here Comes Honey Boo Boo.